We do not keep a waiting list, and we will only invite you to the kennels if we are sure we have a puppy available that would be right for you. You will never be asked for a deposit of any kind until you have seen, and chosen, your puppy. We do not advise that you come to see the puppies until they are at least 6 weeks old. They grow and change so much in those first few weeks that making a choice before that age is very hard to do. 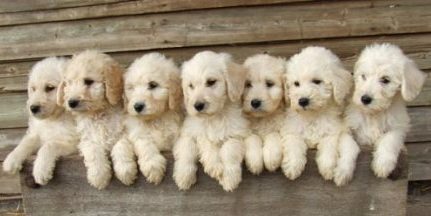 You will be able to see adult Labradoodles as well as the puppies and their parents. 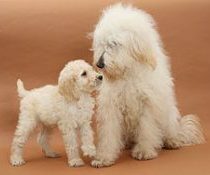 Spending some time with our adult Labradoodles will give you valuable information about how different puppies are likely to develop. Well-behaved children who respect dogs are very welcome. Our puppies are vaccinated at 8 weeks old and 10 weeks old with the full DHPPiL vaccine on both occasions. They have a veterinary health check with their first vaccination. We do not neuter our puppies. Like most vets, we believe that this is best left until they are fully mature. To date, we haven’t come across a vet in this country who is happy to administer an anaesthetic to such young puppies unnecessarily. We worm our puppies fortnightly, starting when the puppies are 2 weeks old. You would receive a veterinary care booklet with your puppy, in which all of these treatments are recorded along with information and advice that you may find useful. 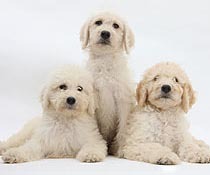 You would also receive a full pedigree certificate detailing your puppy’s breeding history.